Rite of Passage came to my hands – my cybernetic hands - when I was asked if I wanted to review a female fronted melodic death metal band [editor’s note: I never told Maria the band have a female vocalist]. Personally, I hate when female fronted bands use that female factor as a “Look at me! I’m special!” card – Though some bands do need it. The words fast and aggressive describe this album pretty good. It gives me that feeling of craving headbanging to it even in the most awkward, crowded public places. The clean vocals and occasional acoustic guitars come and refresh the songs, taking away that cheesy feeling some death metal bands have after a few songs. Listening to Incassum, I can’t help but to think about a now extinct Prog Metal band from my area. From the vocal style to the music they are quite alike and it gives me a pleasant flashback. Sadly enough it also takes me back 5-6 years to the time I would listen to stuff that sounded brOOtal just for the sake of being brOOtal. Sharleen Kennedy’s vocals are a mix of Candace Kucsulain (Walls of Jericho) with Lacey Mosley (ex-Flyleaf) and the music seems to me to be a mix of Swedish Death Metal with a couple of touches of Prog Rock, a tiny bit or Core and a teaspoon of Opeth’s mysticism. To some point, it actually had a bit of a Dethklok feeling to it. Although I have mixed feelings about the album I’m going leave those subjective matters aside and tell you that Rite of Passage is a good Melodic Death metal album. It moves away from what the Finnish have done to the genre – though I will clarify, I adore Finnish death metal. 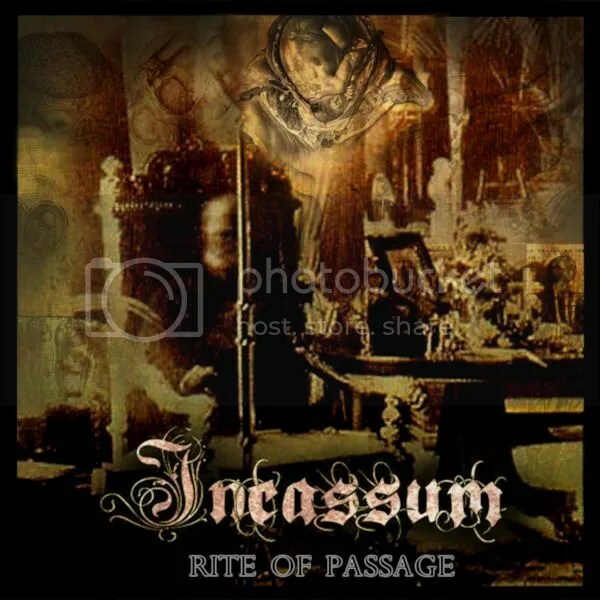 Incassum is like a breath of fresh air out of that melancholic aura that Melodeath is now. To make it into a pretty analogy, it is like climbing to a tree top after being lost for weeks in the black forest. Incassum are not one of those bands that play on the female factor. They should get rid of the Arch Enemy stigma associated to that kind of bands and just promote themselves as what they are: A good Melodic Death Metal band. This entry was posted on 12th November 2012 at 6:35 pm and is filed under CD, Metal with tags Archenemy, Candace Kucsulain, Death Metal, Dethklok, Flyleaf, Icassium, Incassum, Lacey Mosley, Melodic death metal, Opeth, Rite of passage, Sharleen Kennedy, Walls of Jericho. You can follow any responses to this entry through the RSS 2.0 feed. You can leave a response, or trackback from your own site.